A stable secure long-term water supply is the foundation on which Arizona’s growing economy is built. Key industries not only contribute to our economic growth, but have played significant roles in managing our water supplies. Learn how Arizona’s industries thrive while being efficient in their water use. Arizona farmers are water smart. Arizona's agricultural communities are some of the most efficient water users in the nation. In the central portion of Arizona (mostly Maricopa and Pinal counties) agricultural water users are required by state law to implement water conservation practices including lining canals, laser leveling of fields and other best management practices. These agricultural irrigators must be at least 80'% efficient with many exceeding the legal mandate. Other agricultural areas have also adopted significant water conservation practices. 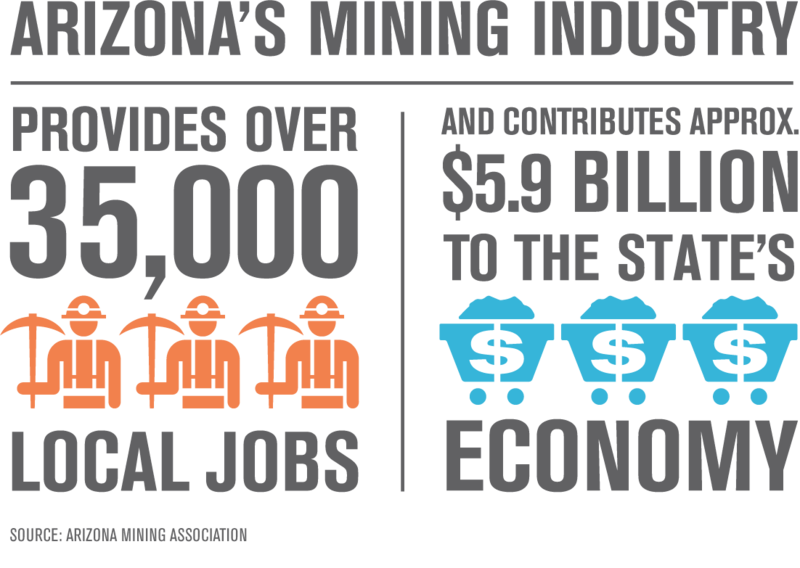 Arizona mines are a model of efficient industrial water use. Many mines in Arizona recycle a majority of their process water through cap­ture of tailings water for uses within the operation. This has the impact of reducing their overall fresh water demands and impacts on available water resources. Arizona golf courses use water efficiently Arizona is one of the few states that limit the amount of turf area and water used for lakes on golf courses. For example, new golf courses are generally only allowed five acres of turf per hole. This requirement changes the way that we design our golf courses. Turf is concentrated on the tees, greens, and fairways, leaving the rough areas as native desert In addition to turf requirements, golf courses in central Arizona are required by state law to implement water conservation practices. Over half of all water used on golf courses in central Arizona rely on renewable water supplies such as recycled wastewater or surface water from the Colorado, Salt and Verde Rivers.